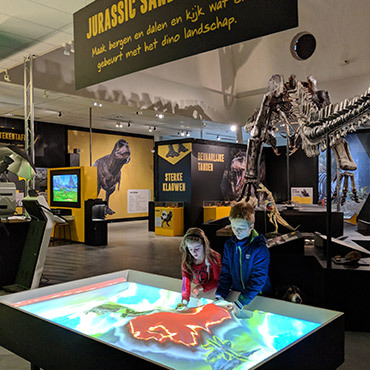 At Dinoland in Zwolle, children from 2 to 14 years can learn, discover and play around the dinos. There are so many things to do indoors and out. Rain needn’t stop play at Dinoland! 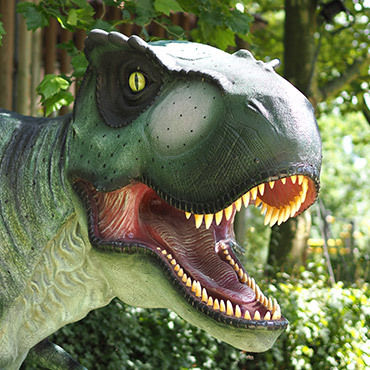 Test your knowledge during the Dino exploration trail and discover all the dinosaurs around the park. 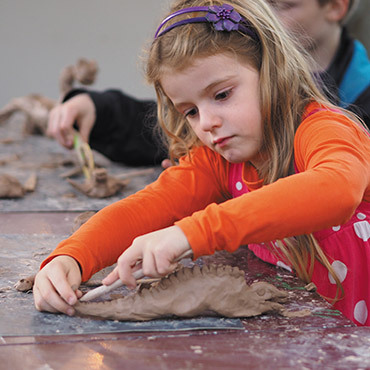 Play in the indoor play centre full of equipment and interactive games, grab a bite to eat in the restaurant, dig up a dinosaur skeleton, test your palaeontology skills in the lab, conquer the climbing course, play mini golf and try out the playground! Dinoland works with a special activity card. On buying a day ticket, you receive this activity card. It entitles you to 1 x climbing course, 1 x climbing tower, 1 x fossil hunting in the Fossil Dig, 1 x laser game and 1 x midget golf. 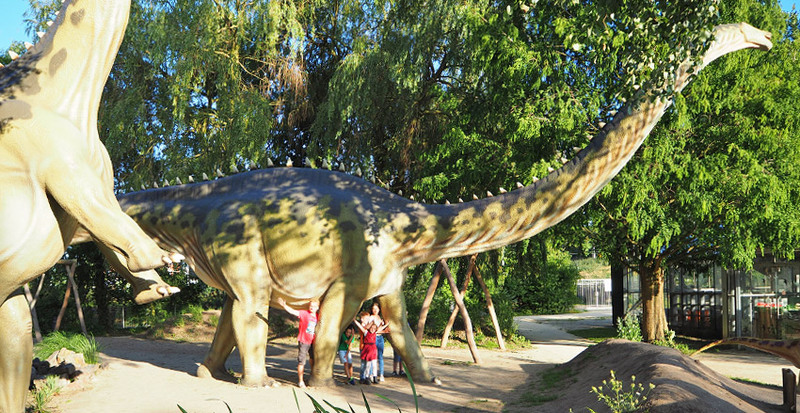 The park is home to more than 100 dinos from the Triassic, Jurassic and Cretaceous periods. Some are small while others can be 15 metres tall! All the dinos feature information about their species, their habitat and the period in which they lived. Colour in your dinos and bring them to life on the magic drawing table. Visit a dino dig using virtual reality. Create your own 3D dino. Get a photo with T. rex. 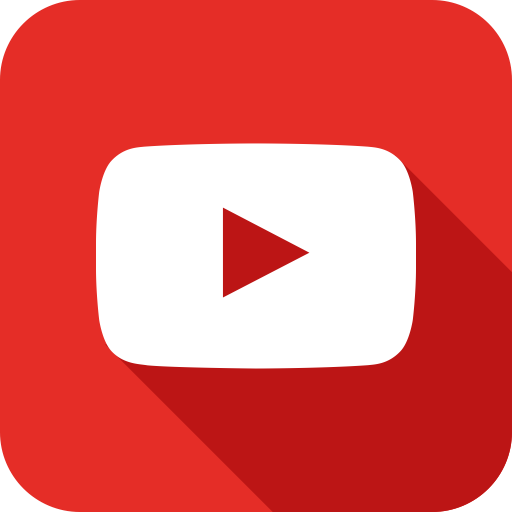 Create a T. rex world using the virtual sand table. 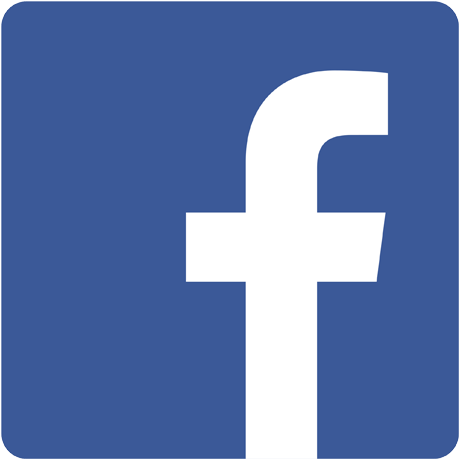 Do you know all about dinosaurs? 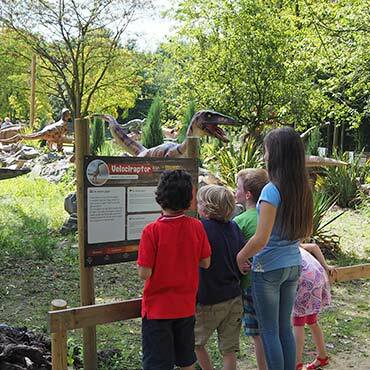 Test your knowledge on the dino exploration trail. 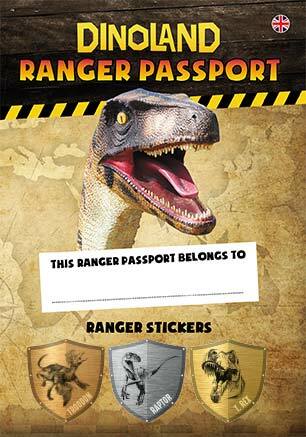 It is free of charge and introduces you to all the dinosaurs in the park. You'll also learn more about the discovery of dinosaurs in the Wild West era. Are you a real daredevil? 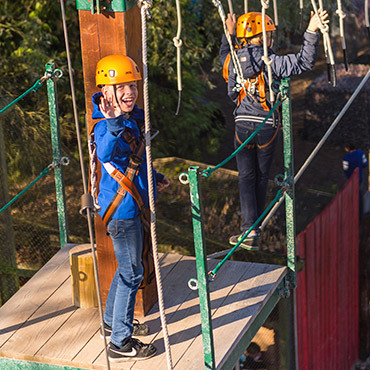 Then you'll climb straight up our 8 meter climbing course and tower! For these activities, you need to be at least 1.30 m tall and be wearing closed shoes. We'll provide a helmet and safety lines of course. There is a special low level course for smaller children, without the need for safety lines. * A surcharge is requested for this activity to cover the costs of materials and keep the price of park entrance tickets low. 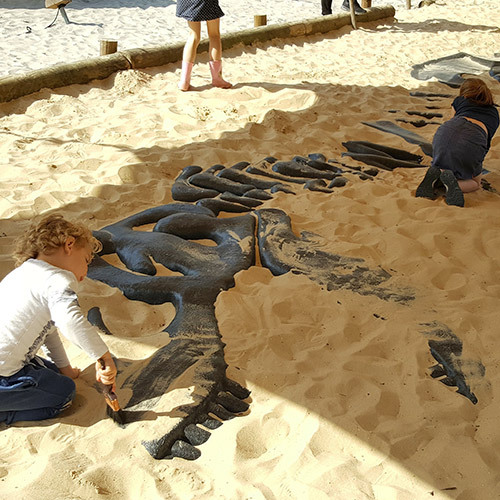 There's a mega T-Rex skeleton hidden under the sand. We could sure use your help unearthing it! 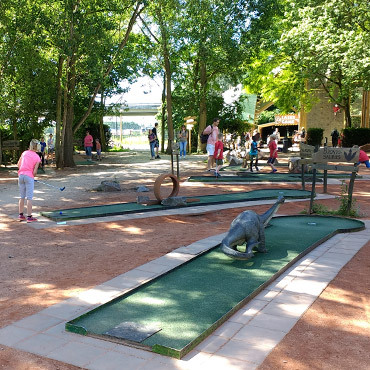 Hit a few balls on the 18 hole mini golf course. It's named after the little Minmi Ankylosaurus. 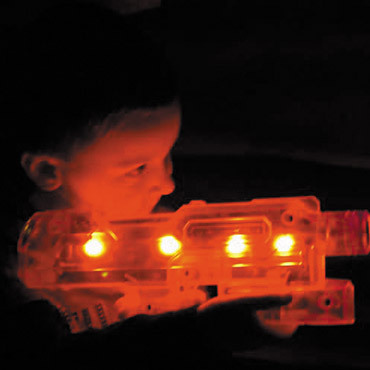 The battle is on for the dinosaur caught in the laser game arena! Take care, you'll be hit before you know it! 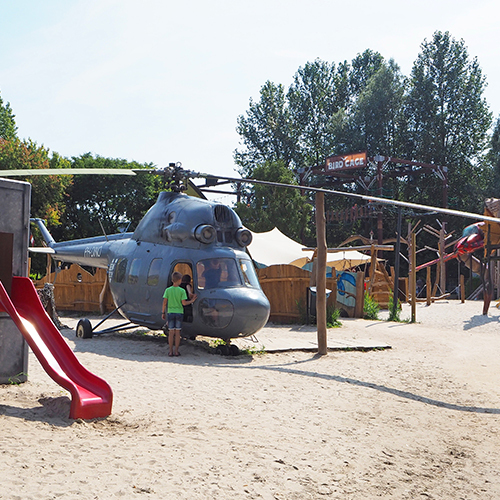 Playground with play hill, plane, helicopter and jeep. There's plenty of room for fun. 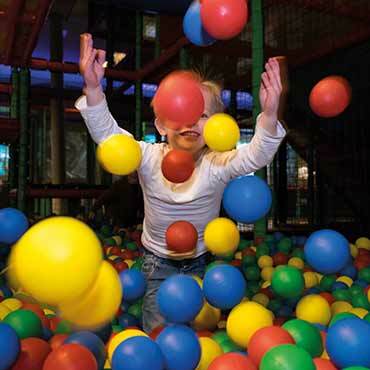 Clamber through the playing equipment, roll around the ball pit, slide down the slide and play exciting interactive games. We have a separate play area for toddlers. 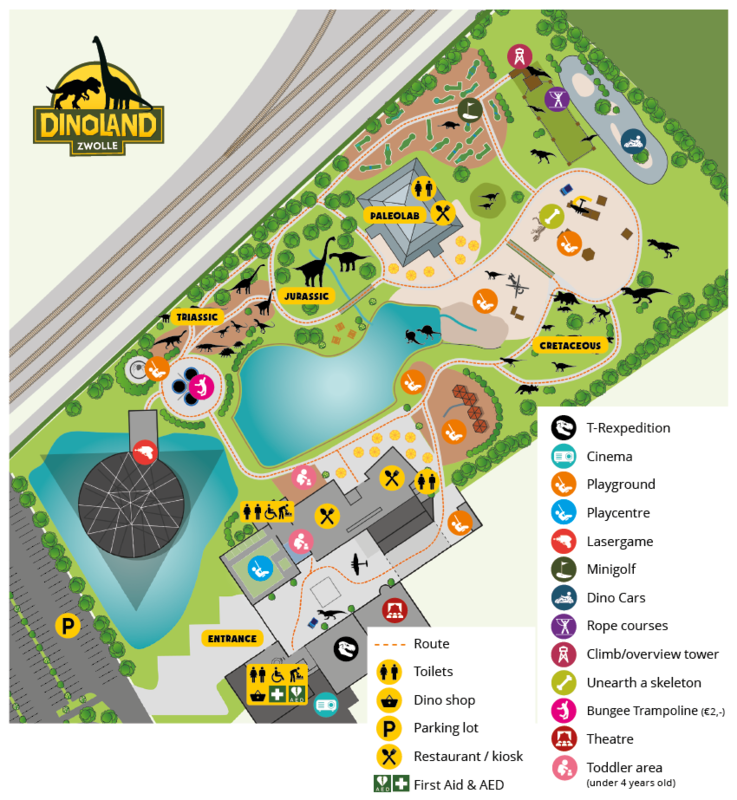 At 8 locations around the park, you can bring a dino to life using your smartphone or tablet! Watch them run, feed, dive and fly!